When the count documents are correct and complete, compare them, item by item, with the applicable stock records to determine whether differences exist. If no differences exist, post the matched count cards or matched items in the inventory listing to the applicable stock records. Enter the Julian date of the inventory and the notation INV in the REQUISITIONS OUTSTANDING column of NAVSUP 1114, and enter the inventory quantity (which should be the same as the existing stock record) in the ON-HAND CC. See figure 12-16. If differences exist in on-hand quantities, locations, or other stock record data, reconcile such differences by the procedures outlined in NAVSUP P-485. Without stock records, it would be impossible to maintain adequate stocks of materiel necessary for the operation of the medical department of a ship. Procurement of stock must be based on the information contained in the stock record cards. Inventory control comprises procurement, stocking, issuing, and accounting for materiel. The Stock Record Cards Afloat, NAVSUP 1114m (Manual), are the primary records of inventory control. Maintain a stock record card for each stocked repair part or consumable and for each SIM-DTO item. 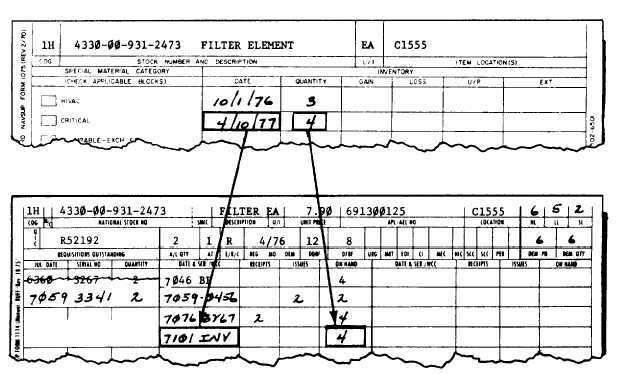 NAVSUP 1114m, which is shown in figure 12-17, is an IBM type of stock record card in which significant management data elements can be keypunched to provide the capabilities of nonautomatic data processing equipment. NAVSUP 1114 (Manual), which is illustrated in figure 12-18, is identical to the NAVSUP 1114m in design. NAVSUP 1114 (Manual) is a continuous-feed stock record form that eases the typing of the top and bottom lines of new stock record cards that must be prepared when the keypunched and interpreted NAVSUP 1114m cards are filled. This form is also useful when new items are added to shipboard stock between supply overhauls. Retain all stock records until they are replaced upon completion of the next supply overhaul.